who successfully chopped 185 wooden blocks in 2 minutes. hosted by Ian Wright, the famous footballer and TV presenter. We are a very large family of enthusiastic, honest and friendly members practising an effective martial art in the pursuance of total fitness and the ultimate self-defence. Our organisation is worldwide. The Wu Shu Kwan culture of respect, honesty and goodwill is actively propagated and positively promoted. Chinese Boxing, commonly known in the West as practical Kung Fu, is the oldest name used by the Westerners to describe the systematic and effective Chinese art of self-defence when they first encountered it and were fascinated by what they saw. Of course, Chinese Kickboxing rather than Chinese Boxing would have been the more appropriate description, if the word kickboxing had existed then. Chinese Boxing is indeed a traditional martial art and not Western boxing where two prize-fighters with gloves and in shorts fighting in a ring. The aim of Chinese Boxing is to progressively train your body as well as your mind to achieve positive health and to acquire effective skill to defend yourself successfully at all times. Chinese Boxing is the art of total self-defence. 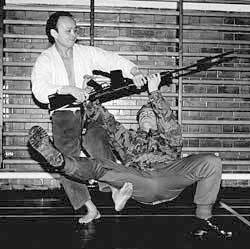 Training with various weapons will be taught only to the more advanced students who have already acquired a solid grounding. Chinese Boxing or, to use the present-day terminology, Chinese Kickboxing had been practised by the Chinese for many thousands of years and was the result of the wisdom of the ancient Chinese to react, in the main, to vital military and serious survival requirements at that time. The famous Shaolin Temple in China had, however, played a part in the development and spreading of Chinese Boxing, which is the forerunner of all other forms of martial arts in the East. Translated from the Chinese language, Wu means martial or fighting; Shu means the art, the way or the method; and Kwan (or Guan in Chinese pinyin system) means a centre or an association. Put together, Wu Shu Kwan therefore means Chinese Boxing Centre, i.e. Academy of Martial Art. Chinese martial arts exist in many forms and guises, many of which are a mere physical pastime or a tradition of make-believe. Some are far from complete enough to be an effective self-defence system while others lag behind in the modern science of physical training. However, Wu Shu Kwan is a total system of fitness and self-defence of training par excellence. Some people may be more familiar with the term Kung Fu rather than Chinese Boxing. Both these terms describe more or less the same thing; however, Kung Fu (meaning skill or time in the main) usually refers to the flowery, piecemeal and sometimes irrelevant type of Chinese martial art on the screen, whereas Chinese Boxing originated from the oldest name used by non-Chinese to describe the systematic and pragmatic self-defence art of China. Indeed, some practitioners liken Kung Fu to fireworks for display and equate Chinese Boxing with the real dynamite. Wu Shu is not Wu Shu Kwan: the former is a dynamic dance-like demonstrative art, whereas the latter is a style (or school) practising real martial art for fitness and self-defence. If Wu Shu represents a chemical element called hydrogen, then Wu Shu Kwan converts this powerful element into a mighty hydrogen bomb. With years of dedicated hard training and ensuing personal realisation, Grand Master C. K. Chang collected (not invented) the essential traditional principles and techniques, weeded out the impractical and repetitive ones, organised them in a progressive order and merged them with proven modern science to establish a perfect system of training which is suitable for both men and women, young and old. Wu Shu Kwan’s training system is therefore unique, comprehensive and practical, and it fuses indispensable ancient techniques with vital modern scientific training know-how. Anyone who wants to learn can only do so under the instruction from a qualified Wu Shu Kwan instructor in an official class. Everyone, man or woman, young or old, can certainly benefit from competent instruction. All Wu Shu Kwan instructors are qualified black belt holders, and many of them are very well-known and highly ranked, including two Guinness World Record holders. Just look at the action pictures on this website, and you will appreciate their superb skills. We do not use static poses or drawings because any half-baked, self-styled martial artist can easily use them to fool the public. Only genuine action photographs like ours will show the real techniques of experts. Like everything else in life, you have to be aware of imitators. Protect yourself from unqualified persons masquerading as instructors. Many unscrupulous persons have attempted to confuse the public with a well-established name like ours; if in doubt, please check with us. It really is a case of buyer – or martial art beginner – beware. C. K. Chang (8th Degree Black Belt, MCMI), the Grand Master, disarming a soldier armed with a bayonet. Practical martial arts, such as Wu Shu Kwan Chinese Boxing, originated in the main from military art. 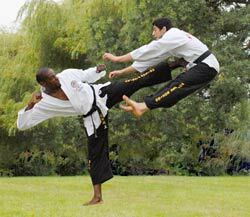 Najib Orfani (1st Degree Black Belt) (right) on the receiving end of a powerful side kick from Paul Ingleton (5th Degree Black Belt). Trish Chang being interviewed by Ian Wright, the famous footballer and TV presenter, before the Guinness World Record attempt. To watch the video, please go back to the screen at the top of this page. 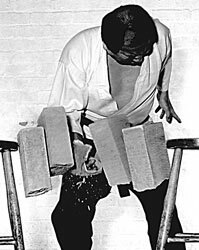 Eddie Cheah (8th Degree Black Belt), a Senior Master, breaking 2 building blocks with a back slap, a special breaking technique found only in Chinese martial art. 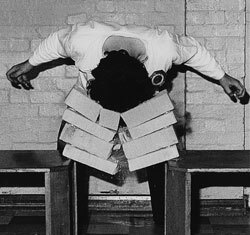 Andy Hucklesby (7th Degree Black Belt), a Senior Master, who instructs at Queen Mary and Westfield College, University of London, kicking 6 building blocks placed upright on a support. The legs are much longer and stronger than the arms, and with systematic training they can be developed into unassailable and overpowering weapons for self-defence. 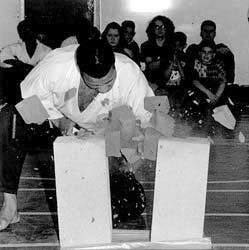 Peter Johnson [6th Degree Black Belt, BSc (Hons)], a Senior Master, is one of the few experts in the world who can break three bricks with one mighty chop. Wu Shu Kwan has many high-ranking instructors down under. Tony Parsons (3rd Degree Black Belt) (Australia) (left) and Barry Tollefsen (3rd Degree Black Belt) (New Zealand), both Senior Masters, team up to show their kicking techniques. 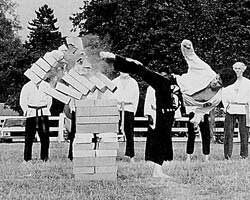 Des Radcliffe (3rd Degree Black Belt), a Senior Master, using his head to break 4 building blocks to show how to unleash Wu Shu Kwan's phenomenal power. He is one of the toughest martial artists in the world. 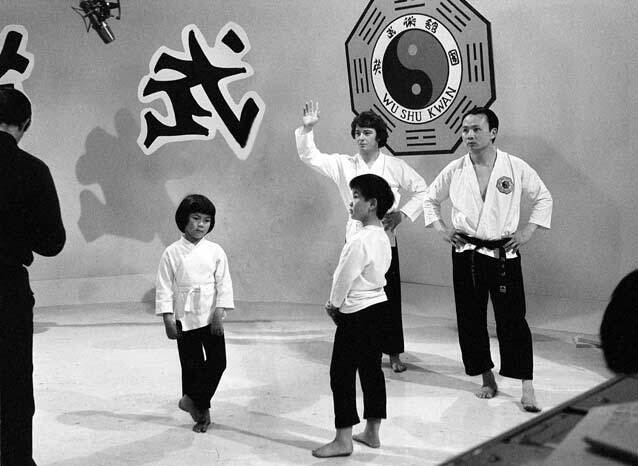 Grand Master C. K. Chang (right) took the country by storm when he first introduced Wu Shu Kwan to the UK in the late 1960's. BBC's Blue Peter programme invited him to perform a spectacular display for its nationwide audience. He is pictured here during filming with the presenter. Wu Shu Kwan is still as popular as ever and much sought after by all discerning martial artists. A well-attended class conducted by Grand Master C. K. Chang in Aranguez, Trinidad.